This site is under construction ~ it may even be a lifelong project...! 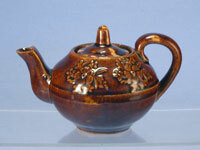 The intention is to add a large number of pots for sale direct from this site. At the moment this section is under development. If you are interested in purchasing any item shown in this section then please contact me for more details. Other pots shown on this site may or may not be available for purchase but there’s no harm in asking. All images and text on this website are copyright protected. You MUST obtain written permission from the copyright holder before using any of this material for any purpose whatsoever. © Paul Bohanna 2011.